I am sending this in hoping that someone will know what kind of bird this is. This is the first time I've ever seen this bird in my yard. Actually this is one of a pair. It's got a very long pointy bill that it uses to burrough into the ground. Looks to me like it's hunting for insects rather than a bird that goes for seeds etc.. It wasn't too afraid of me as I crept up on him and was only about 15 feet from it when I snapped the picture. He actually seemed to pose for me. 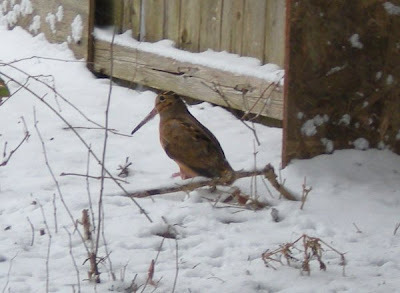 This is an American Woodcock. They mainly eat worms and other insects. They are leaving their usual spots due to the high snow and searching for food.